FORMER Zambia Congress of Trade Unions (ZCTU) secretary-general Roy Mwaba and two Rainbow Party senior provincial leaders have joined the Patriotic Front (PF), citing good leadership qualities being demonstrated by President Lungu and his administration. And PF secretary-general Davies Chama has urged party members to embrace new-comers and work extra hard in mobilising the ruling party ahead of the 2016 general elections. Speaking in Lusaka yesterday after joining the ruling party, Mr Mwaba said he has joined the PF because of its unsurpassed socio-economic programmes that have started uplifting the welfare of people in the country. “After serious reflections on the political developments taking place in the country, I have finally decided not to sit on the fence and be a spectator but to join the PF party so that I can contribute to the development efforts being made by the PF government. “I must also emphasise that ever since President Lungu took over leadership of the party, the PF has demonstrated maturity and dynamism by welcoming new-comers who have been joining the party in the past few years,” Mr Mwaba said. He said after carefully scrutinising the manifestoes of various political parties, he decided to tug along with the PF because the party stands for ideals meant to improve the socio-economic status of Zambians. Mr Mwaba also said the decision to join the PF is one made in the interest of nation-building and sacrifice to the country. “The current challenges we are going through as a country demand a clique of leaders who are dedicated and committed to finding solutions under this very trying moment and the PF leadership has ably demonstrated this spirit and needs the support of everyone,” he said. 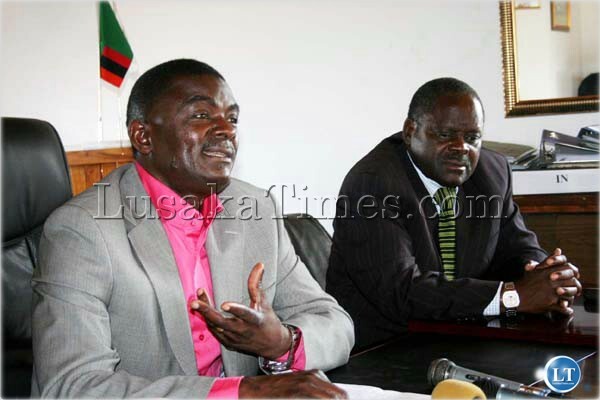 Rainbow Party Lusaka Province chairperson Mulenga Mwiche and vice-chairperson Stanslus Mambo have also joined the PF. They said they have joined the ruling party because of President Lungu’s message of love, unity and reconciliation. “President Lungu is a unifying President we have ever had in Zambia. He has been preaching love, unity and reconciliation and this is what we want as Zambians,” Mr Mwiche said. Receiving the new members, Mr Chama urged the PF membership to welcome new-comers. Mr Chama said politics is about numbers and that he is ready to work with both old and new members. He also said the PF will win the 2016 general elections because of the projects that are currently being initiated and implemented by Government. Njala YabaNyokola. bills they cant pay, Cant afford beer and prostitutes what do you expect. If they just wanted to feed their families they would struggle for the country as opposition. Whether you join PF or not doesn’t make a difference. Who gives a [email protected]? Sad indeed, joining The party on the basis of personal economic benefits and tribal/regional inclinations other than political and economical progress which is in reverse! Much as i dont support such acts,i dont see formidable opposition parties in zambia that can overthrow pf. @zamcab its a good thing you are living in the past because you dont even know what is opposition! After leaving ZCTU life has not be the same for Roy. To him joining PF is more of a job hunt as he is chasing after Kafue Seat in 2016. Things may not be as easy as he thinks though. These guys should be citing Family building as opposed to National Building when they advance reasons for joining Parties of their choice. Ba Roy that is the way to go.The boat has left the station and none will stop it except dropping those who do not want to continue and picking new willing members. Democracy has not sunk in most of our minds. Let people join and leave as they wish. Of course the hyena’s behaviour will always be exhibited in humans as well, hyenas always try and they often succed in snatching the carcass from the Lion’s catch. I read about HH joining PF. I said to myself, thank God oh. That is a very good move oh. why is the move good, if what i read was true, one minister is retiring in 2016, one of key ministries, then try him , and then adopt him to contest the 2022 presidential election, depending on performance. In the PF there will be a number of resignations but that should not worry anybody,it will be a cleansing ritual of the ruling party. Going by the trend in Zambia,my beautiful country, there is no party that will rule for less than ten(10) years. At the time of voting these challenges will have been buried. Well done Mr Mwaba for joining the winning team.Ba Kachema have no future in Zambia since they belong to the stone age era. LEAVE HONOURABLE SAMPA ALONE; WE CAN DO IT AGAIN WITH SAMPA M . AS A VICE PRESIDENT RUNNING MATE. I HAVE HOPE THAT ZAMBIA IS HEADED FOR ATLEAST A BETTER LEVEL OF DEMOCRACY AND A MARKED IMPROVEMENT IN OUR ECONOMY. I WISH ALL RESIDENTS IN ZAMBIA A PROSPEROUS 2016, ONE ZAMBIA ONE NATION.